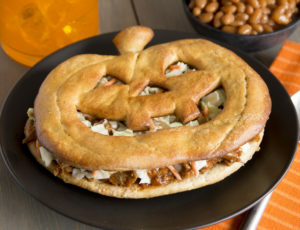 This delicious stuffed pizza will be a hit for your Halloween get together. Spray counter lightly with non-stick cooking spray. Combine 4 rolls and flatten into a 13-inch circle. Place onto a sprayed 12-inch pizza pan. Roll another 4 rolls into a 13-inch circle and cover with plastic wrap. Combine chicken, salsa, corn, BBQ sauce and cumin and mix well. Spread half of the mixture over the crust on the pizza pan. Remove wrap from second dough circle and place it over the top of the chicken mixture. Seal edges of dough together. Bake at 375 degrees F 20-25 minutes. Remove from oven and spread half of the con queso dip over the warm pizza. Carefully sprinkle half of the cheddar cheese along the outer edge of the pizza. Put the pizza back in the oven for 1-2 minutes to melt the cheese. Remove from oven and place pizza on cutting board. Cover everything but the melted cheese edge with half of the crushed nacho chips. Slice into wedges and decorate the point with sour cream. Repeat to make a second pizza.